An amazing prize from Sale Sharks! Sale Sharks are playing London Irish at The Reebok Stadium on Saturday 16th April and someone at the game will win the opportunity of a lifetime! The prize goes to the club or school that sells the most tickets for the game and incredibly the current leaders are the Westerland Barbarians from Cumbria who have purchased 52 tickets. Their coach Andrew Brown has also booked the ballboys package for the day. Will 52 tickets still be the top sellers in April? 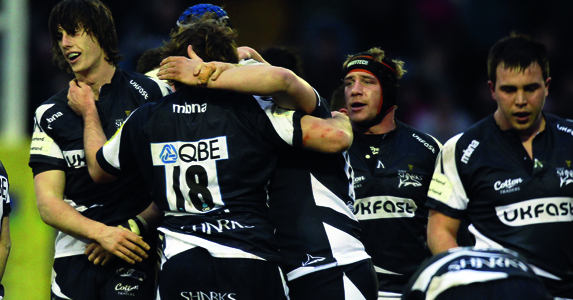 Ø Win a full set of Sale Sharks playing kits. Ø A training session at the Carrington Training Ground by the Sale Sharks Head Coach. Ø Expert GPS analysis of the training session. Ø A behind the scenes matchday experience to a Sharks match including pre and post match interviews with the coaching staff. Ø The opportunity to play a full match at Edgeley Park with full media coverage, match announcer, press conference and photographer. If your club or school would like the opportunity to win this lucrative prize or for more information on our Reebok experiences, please email community@salesharks.com or call 0161 286 8888 ext 268.